Mānoa translates as "wide or vast" and is descriptive of the wide valley that makes up the inland portion of this ahupuaʻa. The ahupuaʻa of Mānoa has been a well-populated place. The existence of heiau and trails leading to/from Honolulu indicate it was an important and frequently traversed land. John Papa ʻI'i wrote of the many trails leading into and throughout Honolulu and the surrounding areas. A trail led out of town at the south side of the coconut grove of Honuakaha and went on to Kalia. From Kalia it ran eastward along the borders of the fish ponds and met the trail from lower Waikīkī. The trail went above the stream to Puʻu o Mānoa. The evidence of numerous agricultural terraces indicates an abundant food source, probably to support a fairly large population. Its inclusion in many legends and tales also suggests Mānoa Ahupua'a was a significant and well-loved area. Mānoa Valley was a favored spot of the Ali‘i, including Kamehameha I, Chief Boki (Governor of O‘ahu), Ka‘ahumanu, Ha‘alilio (an advisor to King Kamehameha III), Princess Victoria, Kana‘ina (father of King Lunalilo), Lunalilo, Ke‘elikōlani (half sister of Kamehameha IV) and Queen Lili‘uokalani. Mānoa was given to the Maui chief Kame‘eiamoku by Kamehameha I after his conquest of O‘ahu. After Kame‘eiamoku death, the land was inherited by his son Ulumāheihie (or Hoapili), who became the governor of Maui during the reigns of Kamehameha II and Kamehameha III. Liliha, the daughter of Hoapili, inherited the lands in 1811 and brought them with her to her marriage with the high chief Boki, governor of O‘ahu. In early times Mānoa Valley was socially divided into “Mānoa-Aliʻi” or “royal Mānoa” on the west, and “Mānoa-Kanaka” or “commoners’ (makaʻāinana) Mānoa” on the east. An imaginary line was said to have been drawn from Puʻu O Mānoa (Rocky Hill) to Pali Luahine. 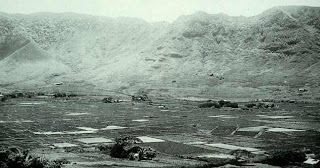 The Ali‘i lived on the high, cooler western (left) slopes; the commoners lived on the warmer eastern (right) slopes and on the valley floor where they farmed. Oahu's first sugar plantation was established here in 1825, by an Englishman named John Wilkinson. Wilkinson died in 1826, the mill for the sugar was moved to Honolulu. In the early part of the nineteenth century, the Japanese began to move in to the upper valley to start truck farms, growing strawberries, vegetables, such as Japanese dryland taro, Japanese burdock, radishes, sweet potatoes, lettuce, carrots, soy beans and flowers to sell to the Honolulu markets. The image shows Mānoa Valley taro loʻi (UH Heritage, 1890.) In addition, I have added other related images in a folder of like kind in the Photos section on my Facebook page.